New to the beauty industry! I love learning all of the different aspects of the salon! I have aspirations of becoming a Cosmetologist in my near future. I enjoy being the smile behind the phone and the first to welcome you in! I look forward to hearing from you! Art comes in all shapes and forms, and for me, hair and skin are my canvas! I was educated and trained at Paul Mitchell the School, along with my fellow colleague, Alexis! I specialize in color, lightening, balayage, cuts, nails and makeup! My mission is to have my clientele look and feel the best they can be! Hair has been my passion for about 27 years. I trained in New York City and worked in the suburbs for the last 25 years. I am experienced in foils, foilyage, color, hair painting, ombre as well as cuts for women and men. I do believe that good hair can make or break a day. I take pride in everything I do. A guest happy with their hair makes my day! Born into the beauty industry Michelle realized this was the career for her. Seeing her mother as a hair designer and helping her sister at her salon encouraged Michelle to go to school and test her talent. With more than ten years experience Michelle has the greatest desire to expand her skill and knowledge base so she can give the best to her guests. Michelle truly has a passion for beauty and wellness that she want to share with her clients. Enola is a licensed stylist and nail tech who has a passion for learning the latest techniques in the industry and she spends all of her free time enjoying family and researching best practices to implement into her future services. "I can't wait to be a daymaker." Has it been 30 years already?! 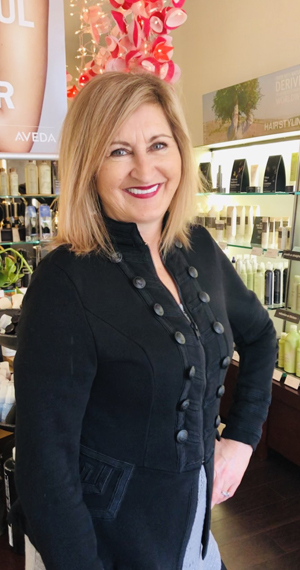 Having been licensed since '87 and the owner of 'As You Like It Salon' since '97, Corinne understands hair and style in an advanced way. Even with all of her experience, she continues her education to learn everything she can about hair and delivering service in a world class environment. Corinne’s connection with her clients is remarkable, and it shows through their loyalty. "I can't think of anything I'd rather do, than your hair!"